It is now well-accepted in security circles that preventive controls are no longer sufficient to defend your organization against today’s cybercriminal-, nation state-, and hacktivist-led attacks. This leaves monitoring and response teams to pick up the slack. But how can you rebalance your security program across prevention, monitoring and response for maximum effect? Organizations have often focused on building out their security operations center (SOC) or critical incident response center or team (CIRC/CIRT) as their central point for improving their monitoring and response capabilities. Whichever name one chooses for this security function, what they all have in common is that they are the organization’s command center for the detection, investigation, and remediation of cyber security incidents. But how can you construct yours? See how organizations detected Heartbleed using network monitoring and operationalized intelligence from RSA Security Analytics. Due to increasing pressures from external threats, organizations responsible for critical infrastructure need to have a consistent and iterative approach to identifying, assessing, and managing cybersecurity risk. Recognizing that the national and economic security of the United States depends on the reliable functioning of critical infrastructure, an Executive Order titled “Improving Critical Infrastructure Cybersecurity” (EO 13636) directed the National Institute of Standards and Technology (NIST) to develop a voluntary framework for reducing cyber risks to critical infrastructure. In the event of a full-scale cyber war, attacks on our critical information systems would pose the greatest risk of damage. The loss of capabilities in places like our banking, communications, and energy sectors would cripple our nation. It is for this reason that Executive Order (EO) 13636 was issued in February to improve cyber security among this critical infrastructure. Advanced threats today do not discriminate – organizations of all sizes are at risk. The impact of an advanced threat can be as daunting to a smaller enterprise as it is to a larger one but with the additional challenges and constraints of budget and security staff. So what is your security posture? Watch this webcast to understand how RSA Security Analytics provides visibility, threat intelligence, and analytics to all organizations – and how you can start small. Defending against today’s sophisticated attacks requires a shift in security investments from prevention to a balanced mix of prevention, detection, and response. The challenge is how to make this shift given limited resources and expertise. 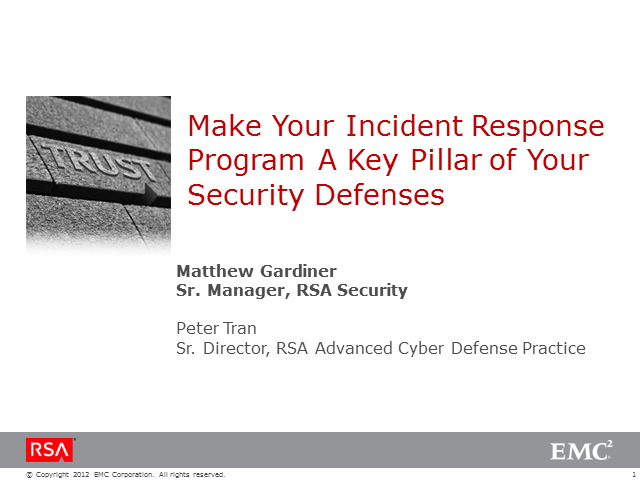 The RSA Advanced Cyber Defense Practice can help by improving your breach readiness, response and resiliency with a three-prong approach: optimize the use of preventive controls, reduce attacker free time, and reduce the time it takes to execute an appropriate response. Unify your security strategy, operations and technology implementations, and produce an actionable security improvement plan with the help of the RSA Advanced Cyber Defense Practice. Learn more at this important webcast. Today’s IT security threats are multi-faceted, dynamic and stealthy, and who is the most likely target is very hard to predict. Actionable intelligence fed to an agile security operations center (SOC) is critical as many threats cannot be prevented, but consequently must be detected and remediated quickly. With a best-in-class SOC, you have the potential to reduce your average incident response time by up to 60%. This must-see webcast will provide insight on how to best approach building or building-up your SOC. You will see RSA’s SOC-enabling technologies in action in the context of a realistic threat scenario and have the opportunity to deep-dive into four additional technical demos after the webcast. Don’t miss this chance to hear from and ask questions to RSA’s Chief Security Strategist, Jason Rader. Jason is currently focused on working with clients to develop enterprise security management strategies that include virtualization and cloud security, incident response, Advanced Persistent Threats (APT), and user awareness. Prior to this role, he designed and matured the strategic security offers within EMC’s Global Security Practice, and enjoyed worldwide success as a security consultant and technical trainer outside of EMC. Organized criminals, nation-state groups, and hacktivists continue to wreak havoc with organizations of all sizes in spite of their security teams’ best efforts. The problem is an over-reliance on antiquated incident management processes, over-dependence on obsolete technology, and failure to use intelligence-based detection approaches. This session discusses how to succeed against advanced adversaries by transforming your security program using big data analytics and by focusing on what really matters to your business. As rapid advances in technology move countries, institutions, and people closer together, they also shrink the distance between us and potential adversaries. Today’s organizations are at an ever increasing risk of having their sensitive data accessed by sophisticated and continuously evolving cyber attackers. In this segment of the RSA Advanced Threat Video Series, you’ll hear top leaders in the field of cyber security discuss the unique challenges of living in a virtually connected world. Discover why old security models are ineffective in today’s threat landscape and how to better protect your organization from an attack.